What a difference a week and a half makes! 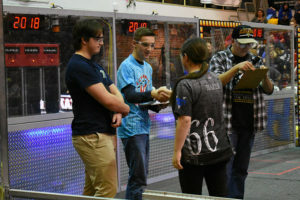 At the unofficial Week Zero Scrimmage on February 17, our robot picked up and scored cubes on the Switch, but could not score on the high Scale since it lacked an elevator. Unfortunately, we seeded second from last! However, just a week and a half later at the WPI District Event, we competed with a complete robot including the elevator and seeded first! During alliance selection at the WPI District, our team chose 78 Air Strike and 3466 Vikings Robotics as our partners for the elimination matches. We played well together and progressed through the quarter-finals and semi-finals. 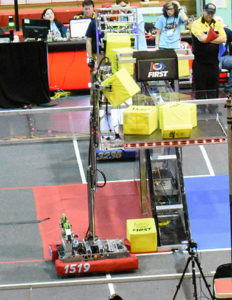 In the first round of the finals, we had a bizarre occurrence of getting the robot’s elevator belts stuck in the Lexan wall of the Scale near the beginning of the match. As a result we started collecting penalty points by the second. If not for those penalty points, our alliance would have won that match despite our robot being disabled! In the second finals match, our operator control laptop froze up, preventing the drivers from controlling our robot and causing us to lose the match by just a few points. 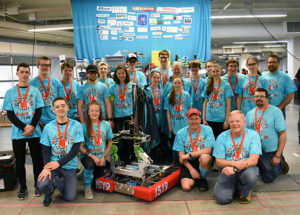 Despite these disappointments, we congratulate the third-seeded alliance of 88 TJ2, 4564 Orange Chaos, and 3623 Terror Bots on being district event winners!